Our delicious Miss Grace Confetti Cake is a customer favorite! 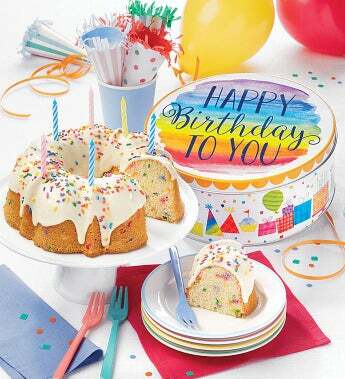 Each rich vanilla cake is filled with sweet confetti sprinkles, topped with a sweet vanilla confectionery coating and is delivered in our festive birthday gift tin complete with 24 candles. A birthday design complete with music! Every time you lift the lid our birthday tin plays "Happy Birthday to You"! A perfect gift idea or dessert for your own parties and get-togethers. OU D.